Five star dessert! Chocolate yum topped with New York Style cheesecake. The chocolate is the lightest fudgy brownie ever! Not too sweet, rich chocolate, light as a feather. The cheesecake is just barely dense, creamy without sweetness, the perfect foil for the deep chocolate flavor of the brownie. Amazing! Fabulous! The best dessert for a special occasion – like Valentine’s Day – any occasion that calls for chocolate. Or delicious. 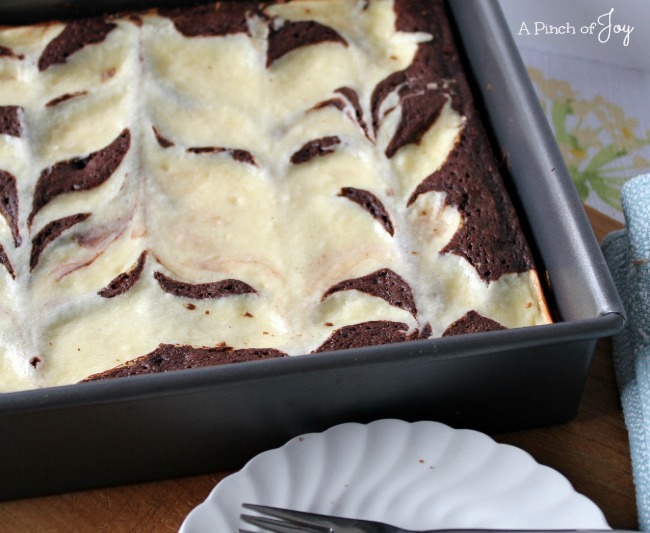 The melted butter gives the brownie it’s rich flavor and light texture. The directions are pretty straightforward and easy to follow. 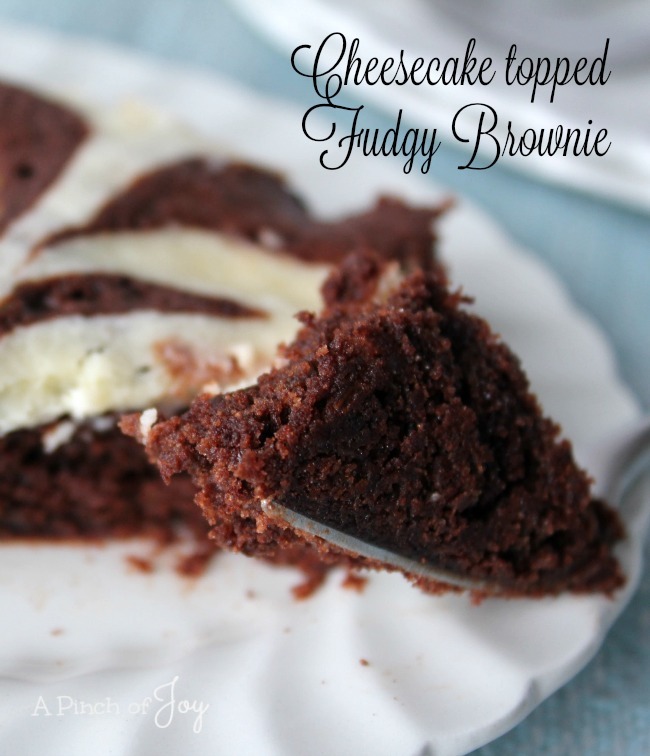 Mixing the brownies and then the cheesecake is quick and easy. You’ll probably have them both mixed before your oven is preheated. 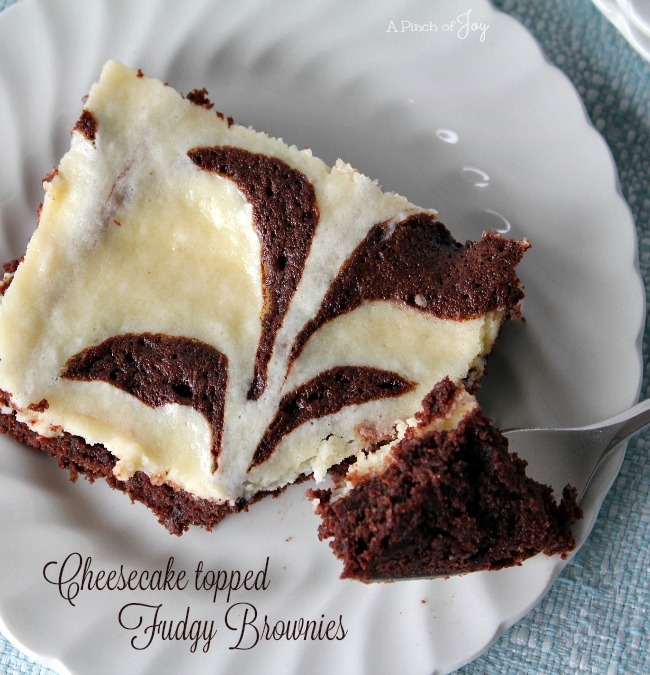 It’s better to make the furrows as described than it is to just drop the cheesecake mixture into the brownie. The end result is neater looking with an evenly distributed cheesecake. My furrows always come out on the shallow side, but the deeper you make them, the more cheesecake is actually in the brownie. You can cut the recipe in half and bake in an 8×8 greased pan. Begin watching at the 20 minute point until the brownie pulls away from the side of the pan. Whichever size you make, be careful not to overbake. Chocolate yum topped with New York Style cheesecake. The chocolate is the lightest fudgy brownie ever! Not too sweet, rich chocolate, light as a feather. The cheesecake is just barely dense, creamy without sweetness, the perfect foil for the deep chocolate flavor of the brownie. Melt butter in microwave, about 1 minute. Measure sugar and cocoa powder, mix together in large mixing bowl. Add melted butter, stirring to mix thoroughly with sugar and cocoa. Stir in eggs and vanilla, then add remaining ingredients. In separate bowl, combine the cheesecake ingredients. Mix by hand or at medium speed until cheesecake is smooth. Draw a narrow furrow the length of the brownie mixture in the pan, and spoon cheesecake into the furrow. Space furrows so that there will be 5 or 6, drawn and then filled with cheesecake. When furrows are filled, use a knife to draw a line perpendicular to furrows, through the cheesecake and brownies. Space the lines evenly, again planning for five or six running the short way across the pan. Bake for 25 minutes or until batter begins to pull away from the sides of the pan. Cool before slicing. Store refrigerated. I would really enjoy one of those yummy brownies right now. Hope you are having a great day and thanks so much for sharing with Full Plate Thursday. This looks and sounds delicious. I’m sure they won’t last long in my house. They ARE really good! Hope you like them as much as we do!